The genus Gentiana includes nearly two hundred species, distributed from boreal to tropical regions, although the majority are found in the north temperate zone. A large number of species are found in Europe, more than sixty having been reported from Russia, and there are nearly one hundred in North America. Several very beautiful forms come from the Swiss Alps, which rarely attain a height of more than three or four inches. The deep blue flowers of these diminutive specimens retain their color for years after being pressed for the herbarium, thus differing from many of the larger forms whose corollas quickly fade. 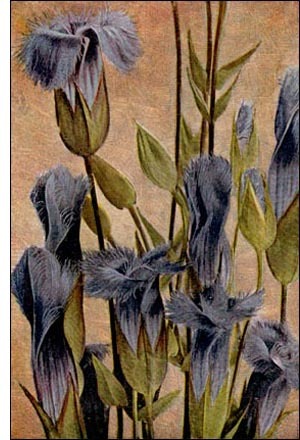 One of the most attractive and familiar of the gentians is the Fringed or Blue Gentian. It is generally found in low grounds, along water-courses or ditches, and while quite generally distributed, it is sparing of its favors, as the long peduncles that terminate the stems or simple branches support but a single flower. The plant grows to a height of from one to two feet, and the leaves, placed opposite to each other, have rounded or heart-shaped bases attached directly to the stems, entire edges, and tapering points. The skyblue flower is bell-shaped, nearly two inches long, and with the lobes strongly fringed. This is partially enclosed by a calyx, which is nearly as long as the corolla. A much more common form, found growing in field and woodlands, is the closed gentian. The fanciful name, Cloistered Heart, has been given to the plant because of the story that once a fairy queen sought to elude pursuit by secreting herself in the flower of a fringed gentian. In order that she might be more effectually shielded, the plant closed the lobes of its corolla, and in gratitude the queen decorated the interior of the flower with brilliant stripes. In order to preserve this fairy painting, the flowers have remained closed ever since.